Nowadays we spent enormous money in interior home designing forgetting about space constraints inside rooms. Usually we design our home as per our wish and money, ignoring an important aspect ‘whether the home really needs us’. 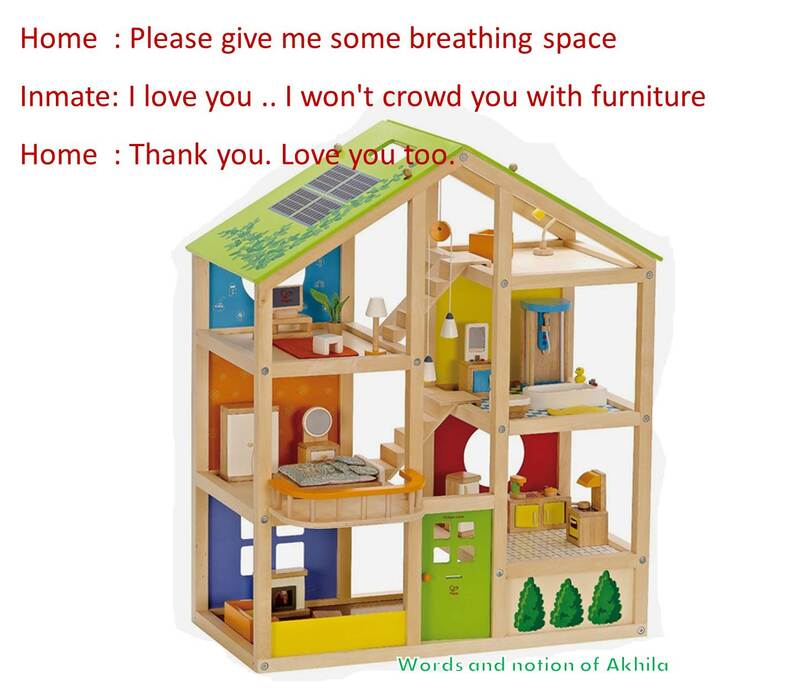 If the home is fully crowded with all sort of furniture, machines etc., what is our need there..? Just ask a few questions yourself. Can you touch the walls and feel its murmurs? If the wall is fully packed with cupboards, photo frames, etc. definitely you can’t even see the wall. Do you have a place to sit on the floor with your kids and family? Or is it fully furnished..? Can you stand and watch out through your balcony or is it covered..? If all the answers are “no , easy to conclude that your home doesn’t look for you. If a few aspects are taken care during interior designing, we can make our home lively and beautiful. First and the most important thing is to have maximum ventilation. Then fill furniture which are essential only, leaving enough empty areas. Ensure to have enough storage places to account the smallest thing so that things won’t be spread here and there. Loved it read it twice!! It was a good comment indeed. .
this is so great and informative post!!! I feel spacious & ventillated rooms sends an impression of positivity too. True that! But I love if the clutter is from books (Which is usually my case. 😛 ). Well said, Akhi, I agree. Overcrowding was a big no-no in all our homes so that we can sit down, children can run about and yes we can hear the walls. Our home is the sacred space that we live in, not a museum for the world to come down, watch and make a judgement. As much as it would look chic and beautiful, a home should reflect the occupants rather than represent our status. I find this very relevant. Nowadays, in the name of space-saving furniture, most of the times the walls of the rooms are occupied…really makes me claustrophobic!